Some of Patrick's work was done in collaboration, so the first section of this page contains books done in that way. A science-fiction story for children, written by Piers Anthony and published by Underwood-Miller in 1990 (hardback) and by Ace Books (paperback) in 1997. 32 illustrations, 9 in colour. Possibly still available. Tiny hardback:44 pp:all in col:107X86mm. A selection of imagery from the previous book MYTHOPOEIKON published by Paper Tiger in 1994. Out of print, we believe. M/147 Watercolour, etc. 1975. 317x635mm. Dave Greenslade also wrote the music for Patrick's project "THE PENTATEUCH", 1979 (See above under BOOKS) Patrick also prepared a further cover painting for the GREENSLADE group's next LP, but unfortunately they broke up before it was used. However the group performed again on a European tour in 2002. M/129 Watercolour, etc. 1974. Diam. 330mm. This image was originally commissioned for the book "The Billion Year Spree" by Brian Aldiss. It has also been included in at least eight other publications - as well as in the permanent exhibition in Gruyères castle. A very popular image - probabaly used more than any other. M/148 Watercolour, etc. 1974. 381x381mm. The music, which most would call "seventies style" rock, inspired Patrick's cover image. The original was sold later at Sothebys in London. An image commissioned in reference to the film "The Planet of the Apes". 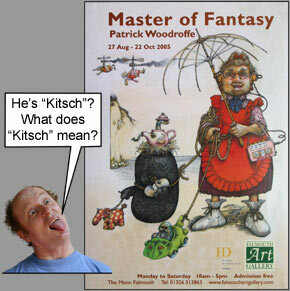 Patrick is too fond of the original to be willing to sell it, so it can still be included in his travelling show. M/154 Watercolour, etc. 1975 355x355mm. Patrick has good memories of those times. Dave Howells, who commissioned the image, was the first person Patrick had ever seen using a mobile phone. PS/14 Oils 1983 : 405x810mm. Also PS/1 - 13 : Sketches, logo, etc. S/54 Oils 1984 : 406x406mm. Many other images (S/1 - 55) were also produced for this project - costume designs, visual ideas, etc., not just for the theatre but also for an expected book. The whole thing was based - of course - on the well-known book by Lewis Carroll. The theatre show expects to be performed again some day in the near future by amateurs at the Minack Theatre in Cornwall. We hope to let you know as soon as possible. See page "NEWS". P.S. The © Copyright of this image belongs to Mike Batt. Click here for the Realaudio track "Children of the sky" from this album. NP/17 Poster in watercolour, etc. 1994 380x290mm. 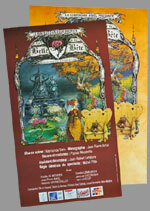 This poster was produced for performances of "Beauty and the Beast" at Le Havre (France) for which Patrick designed every single visual aspect. A large exhibition of his work was installed in the theatre where the performances took place. Jean-Pierre Amiel and Claude Godefroy, who were the main collaborators - along with many, many other folk - leave very pleasant memories for Patrick. NP/18 CD Cover: watercolour, etc. 1995. 230x300mm. This French family-group, which produces songs for young children, is very talented and extremely amusing, but although some of their lyrics are adored by the children in the audience, they are disapproved of by some parents, the subject matter simply being a humorous but sensible attitude to "fundamental principles". Click here for the Realaudio track "Pas D'gris" from this album. NES/1-27. Sketches (A3 format), etc. Patrick worked for approximately six months in Munich, which suited him very well, especially as this gave him the chance to do some models and sculptures in collaboration with a nice friendly team. Not only has his work been included in several exhibitions - "Chemins de Traverse" (Yverdon), "NIFFF" (Neuchâtel) and "Vide-Poches" (Marsens) - but he has also given several talks to French students. Patrick also did some work for a proposed TV version of this story. This round sculpture in bronze was commissioned by Conservateur/Aminateur Étienne Chatton and cast by ARTE BRONZO in Verona for installation on the left side of the entrance into the courtyard of Gruyères castle. It represents the negativity of war and is based on the etching "The Vicious Circle" (P/56) that Patrick produced for "The Pentateuch of the Cosmogony". The original was modelled mainly in "Plastiline". Most visitors to the castle are unaware of how recently the sculpture was done, its appearance so medieval. Patrick sculpted the original in the building just in front of the entrance to Gruyères Castle - the former "École Régionale". Étienne Chatton commissioned this one too, which was also cast by ARTE BRONZO. It is installed on the opposite side of the entrance in order to represent the circular aesthetics of natural love and sexuality, the freedom of life, evolution, etc. Patrick was never satisfied with the result, especially the metallic colourings that were added in his absence. The originals were sculpted mainly in plaster. Most shows included only my own work. Any group shows have the word GROUP in capitals. 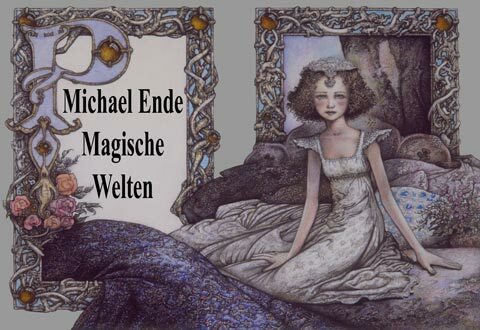 I came back from Munich in November 2007 after contributing to the exhibition in celebration of Michael Ende, the writer of "The Never-Ending Story". This was at the Deutsche Theatermuseum, Odeonsplatz in Munich, but after that it was at the Filmmuseum, Breitestrasse, Potsdam from 15:02:08 till 05:10:08. So now all my sketches are now back home. 2005 - "LE JARDINIER DES MYOSOTIS" All sketches and images done for the book "The Forget-me-not Gardener". September - October 2005. September 2005: LE CHÂTEAU DE GRUYÈRES, Switzerland. This exhibition, which started on the 16th. of September, is now over. 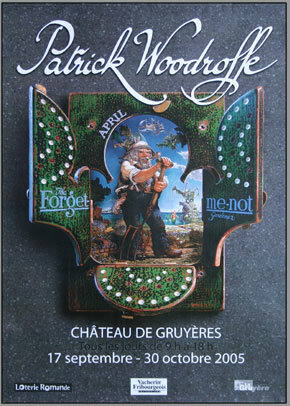 The "vernissage" coincided with the launch of my book "The Forget-me-not Gardener". All drawings recently done for the book were on display. 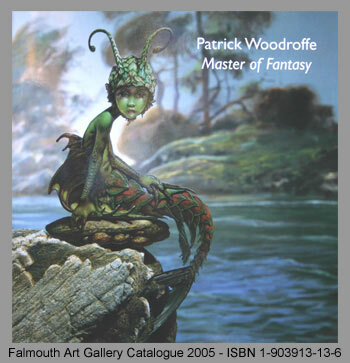 2005 - "MASTER OF FANTASY" A selection of images chosen by Brian Stewart at Falmouth Gallery - August - October, 2005. August 2005: FALMOUTH ART GALLERY, Cornwall, U.K. This exhibition ended in October, but I do have some good news about that. Brian Stewart, the gallery manager, has been brilliant, so have all the people who work there. The number of visitors was 8,611, very popular. I read all the comments made in the Visitors' Book, and the one that pleased me the most was this one: "worth the whole Tate Modern put together". The same show went to St. Barbe Museum, LYMINGTON, Hampshire for the beginning of 2006. The dates were: 04.02.06 to 18.03.06. I had another lovely experience. Natalie, who works at Falmouth Gallery, bought my last Welsh copy of my first book "Micky's New Home" and sent it to a friend (Robert Child) who works for the National Museum of Wales... just to preserve it forever by using the process called "anoxic enclosures". At Falmouth Gallery the catalogues they publish usually remain available to buy well after any exhibition, but these were all sold off well before the end. I had been given 100 copies as a gift, but before the show ended I took 60 copies back for sale. For the catalogue cover Brian Stewart chose "Sea Squitling" and wrote a very kind and enthusiastic introduction. I have always been grateful for his sympathetic response to my work. He is a very pleasant young man, who has actually caused a huge increase in the number of visitors to the gallery, especially the old and the young. This exhibition was sponsored by the Solicitors HINE DOWNING, so I am very grateful to them too. 2005 - "2nd. INTERNAT. FEST. OF ANIMATION - SIX-FOURS" Mainly sketches for film projects were included in this small exhibition. 2005 - "LÉGENDES DE LA GRUYÈRE" A contribution to a small exhibition at the psychiatric hospital at Marsens, Fribourg, Switzerland, (04:02:05 - 06:03:05). Several coloured images for Patrick's Swiss bell project "La Route des Cloches" were included in this show, which lauched a project to add works of art to a footpath into the nearby mountain "La Berra". 2003 - "UTOPIALES" A small exhibition at the S-F Festival at Nantes, France, (07:11:03 - 11:11:03). Patrick worked with other artists to produce a 5M fresco for the town's tram system. 2003 - "GARDEN DELIGHTS" Falmouth Art Gallery, Cornwall. A small GROUP show including just one painting by Patrick - (Ref. H/37) "The Milk-Robbers". 2002 - "CHEMINS DE TRAVERSE" An exhibition at "La maison d'Ailleurs" (28:04.02 - 07:01:03) www.ailleurs.ch Place Pestalozzi 14, Yverdon-les-Bains, Switz. A retrospective of S-F imagery and projects of a relevant style, a show lasting longer than the national Swiss "EXPO 2002". 2002 - "NIFFF" The Fantasy Film Festival at Neuchâtel, Switz. (30:06:02 - 07:07:02). Sketches, Ilford reproductions, etc. relevant to Patrick's work for the Munich film "The Never-Ending Story II". 2002 - "SEA SIDES" Falmouth Art Gallery, Cornwall. A small GROUP show to inaugurate the Maritime Museum. Four works of Patrick included. 2002 - "TEXTE ET BULLE" A small show of drawings at the annual book festival, Damparis, France. 2000 - "bdMANIA" Belfaux, Switz. www.bedemania.ch A small show at the biennial "bande dessinée" festival organised by Claude Hayoz. 1997 - "L'HOSPICE ST-CHARLES" Rosny-sur-Seine, France. Retrospective. 1997 - "LE CHÂTEAU DE GRUYÈRES" Switzerland. Second retrospective in the castle. 1996 - "BONLIEU" Annecy, France. Second retrospective in the same building. 1994 - "THÉÂTRE DE L'HÔTEL DE VILLE" Le Havre, France. A retrospective coinciding with Patrick's stage-design work for a production of "La Belle et la Bête". 1994 - "LE CHÂTEAU DE MONCONTOUR" France. Retrospective. 1993 - "FESTIVAL D'AVORIAZ" France. A small show of Patrick's illustrations for his own book "The Dorbott of Vacuo". 1993 - "BONLIEU" Annecy, France. Retrospective in the town's art centre. 1992 - "LE CHÂTEAU DE GRUYÈRES" Switzerland. A retrospective in the castle, said to have attracted 150,000 visitors. 1990 to 1991 - "RURALISTS" Torquay and Tokyo. A GROUP show of "ruralist" paintings for "Alice in Wonderland". 1988 - "WEISSSCHE GALERIE" Munich, Germany. A GROUP show of British illustrators having worked for Heyne Verlag. 1986 - "CATCHING THE MYTH" A retrospective at "The Metropole", Folkestone. 1979 - "SEACON FESTIVAL" Brighton. A GROUP show with other "Dragon's World" artists. 1978 - "THE PIECE HALL" A retrospective in Halifax, Yorkshire, where Patrick was born. 1976 - "THE WORKSHOP GALLERY" London. Mainly S-F book covers. 1972 - "THE COVENT GARDEN GALLERY" London. The year Patrick left teaching and took up his new career. 1966 - "THE ICA" London. A small show of pen and ink drawings selected by the surrealist artist Roland Penrose.